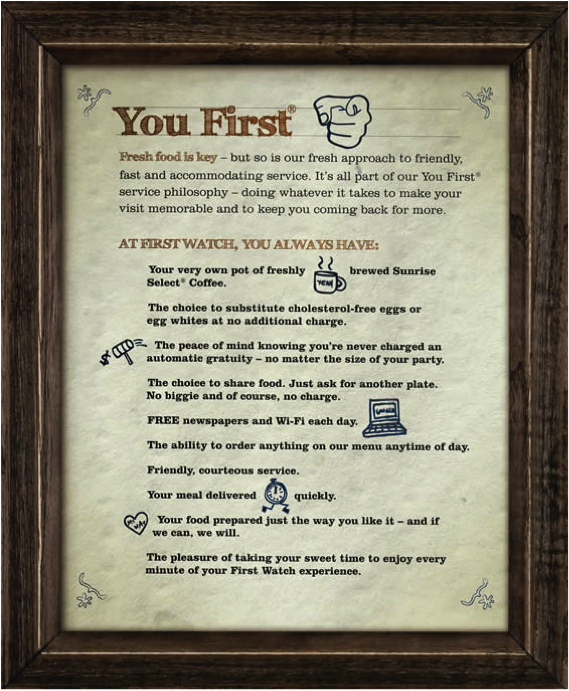 The Friends decided to check out the First Watch Café in Raleigh. We knew it must be good because when we arrived the parking lot was full and we snagged a spot as someone was leaving. Once inside there was line to get a table. We were willing to wait. We grabbed a menu and started planning our brunch/breakfast. After a short wait of approximately 10 minutes, we were taken to a booth that was a snug fit. We continued to pour over the menu to make our selections. The Belle chose the Swisshroom; consisting ham, house-roasted Crimini mushrooms and onions with fresh herbs and Swiss. She had coffee and an English muffin. She was happy with her choice. The Bad Boy selected the pumpkin pancakes, with eggs over easy and chicken sausage. He thought his pancakes were great, giving the complement to the Chef by cleaning his entire plate. The Traveler chose The Market Hash consisting of two eggs any style atop a hash of fresh, seasoned potatoes, house-roasted Crimini mushrooms, zucchini, onions and red peppers with spinach, melted mozzarella and herbed goat cheese. The portion could have easily been shared with another. I was pleased with my meal. The ambiance of First Watch was pleasant. It was artfully decorated. The wait staff was warm and friendly, readily offering suggestions and refilling drinks. I feel they follow their mission statement. The Friends agreed First Watch was definitely a place to return to. We gave it rating 4 out of 5.